O God, who adorned the Priest Saint Camillus with a singular grace of charity towards the sick, pour out upon us, by his merits, a spirit of love for you, so that, serving you in our neighbor, we may, at the hour of our death, pass safely over to you. Through our Lord Jesus Christ, your Son, who lives and reigns with you in the unity of the Holy Spirit, one God, for ever and ever. 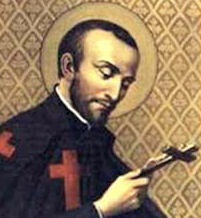 St. Camillus, entirely without means of existence and from his early youth suffering from an incurable wound in his foot, experienced the horrors of the Roman hospitals in the sixteenth century in which the nursing and other staff were drawn from the dregs of the population. He effected a great change for the better, not content with making himself a slave of the sick and diseased he established for them a congregation of Clerks Regular pledged to this work, even when it involved those suffering from the plague, and whatever their state of life or disease. St. Camillus died in Rome on July 14, 1614. Leo XIII proclaimed him patron of hospitals and the sick and Pius XI declared him the protector of all nuns who care for the sick. His name has been inserted in the Litany for the dying. This is also his feast according to the 1962 Missal of St. John XXIII the Extraordinary Form of the Roman Rite. Today is the commemoration of St. Symphorosa and her seven Sons. St. Symphorosa was a Roman martyr of unknown date. Her tomb is on the Via Tiburtina, nine miles from Rome, together with that of seven other martyrs whom a late tradition depicts as her sons. Historically today is the feast of St. Frederick, bishop of Utrecht and Martyr of the faith. What we know of Saint Frederick was recorded by his contemporaries, who praised his wisdom, prudence, piety, and virtues. Poems and hymns were written in his honor. Saint Frederick composed a prayer to the Holy Trinity, which was used in the Netherlands for centuries. St. Camillus' mother was nearly sixty years old when he was born (1550). As a youth he gave himself to the sinful pleasures of this world. His conversion dates from the feast of the Purification, 1575. Two attempts to enter the Capuchin Order were frustrated by an incurable sore on his leg. In Rome St. Camillus was received in a hospital for incurables; before long he was put in charge because of his ability and zeal for virtue. He brought to the sick every imaginable kind of spiritual and bodily aid. At the age of thirty-two he began studying for Holy Orders and was not ashamed of being numbered with children. After ordination to the holy priesthood he founded a congregation of Regular Clerics, the "Ministers to the Sick." As a fourth vow the community assumed the duty of caring for the plague-ridden at the risk of their lives. With invincible patience Camillus persevered day and night in the service of the sick, performing the meanest of duties. His love shone forth most brightly when the city of Rome was stricken by epidemic and famine, and when the plague raged at Nola. Having suffered five different maladies, which he called God's mercy, he died in Rome at the age of sixty-five. On his lips was the prayer for the dying: "May the face of Christ Jesus shine gloriously upon you." Leo XIII declared him the heavenly patron of hospitals and added his name in the litany for the dying. Patron: Bodily ills; hospitals; hospital workers; illness; nurses; sick people; sickness. "That we may conquer the enemy in the hour of our death and obtain the heavenly crown," should be our principal petition today. How familiar are you with the prayers for the dying as given in the liturgy? Do you possess a sick-call set, with a cross, candles, a white tablecloth, etc., in case the last sacraments must be administered? Are you aware that the Church has special prayers which should be said during the final moments before the soul's departure? Unfortunately these prayers are hardly ever explained by those having the care of souls. Express your desire now to responsible persons that you want a priest to assist you at the hour of death with the full liturgical ritual. Become acquainted, while you are still healthy, with the ritual for the sick and dying. Most people find it very consoling. A litany first invokes the various patrons of a happy death. Thereupon follows that final, stirring imperative: "Go forth from this world, O Christian soul, in the Name of God the Father almighty, who created you; in the Name of Jesus Christ, the Son of the living God, who suffered for you; in the Name of the Holy Ghost, who has been poured forth upon you. . . ." Another prayer, in litany form, reminds God of Old and New Testament saints whom He saved from danger and distress; for example, "Deliver, O Lord, the soul of Thy servant, as Thou didst deliver Susanna from an unjust condemnation." And after the sick person has breathed forth his soul, those about petition for a blessed journey home: "Come to his (her) aid, O saints of God; come forth to meet him (her), angels of the Lord, receiving his (her) soul, presenting it to the Most High." Familiarity with these texts will aid us in being interiorly prepared when our own last moment arrives. St. Symphorosa, the wife of the holy martyr Getulius, together with her seven sons. Under Emperor Hadrian she was repeatedly struck in the face; then she was suspended by her hair, and lastly, tied to a rock, was thrown into a river. Her sons were bound to a pillar and their members disjointed with windlasses; thereupon, in various ways, they suffered martyrdom" (about the year 138). (Martyrology). Their bodies were placed in the Church of St. Michael near the fish market in Rome. Frederick lived in Utrecht, in the central part of the Netherlands and was the grandson of King Radbon of the Frisians. He studied hard to become a priest and was very prayerful. When he was ordained, Bishop Ricfried put him in charge of newly converted Christians. Frederick taught them about the Catholic faith. A few years later, he was chosen as bishop of Utrecht. Bishop Frederick got to know the people of his diocese and really cared about them. He gave much importance to missionary work too. In fact, he sent St. Odulf and other brave priests to areas where the people were still pagan and believed in false gods. He wanted them to hear the Good News of salvation. Because of his position as bishop, Frederick made a few enemies. Emperor Louis' sons asked Bishop Frederick to speak to their stepmother, Empress Judith, about her wicked lifestyle. The bishop corrected her gently but honestly. Unfortunately, the empress did not take the advice well and she grew angry and was insulted. Another challenge was the pagan people who lived in the northern part of Frederick's diocese called Walcheren. St. Frederick sent priests to bring these people the love of Jesus. Frederick knew the area was dangerous and unfriendly. He kept close to the priests whom he sent. He encouraged them and tried to help the people receive Christianity. But they were not ready to listen in any way. They resented the bishop's concern for them. St. Frederick continued his work in the diocese with love and care. Then on July 18, 838, after the bishop celebrated Mass, he was quietly making his thanksgiving when two men attacked him with knives. A sentence from Psalm 116 crossed his mind. Slowly, the dying bishop prayed: "I walk before the Lord in the land of the living." A few minutes later he died. Some say Empress Judith sent the hired killers because she hated the bishop. Others think the people from Walcheren were responsible. The murderers were never caught and punished. But Bishop Frederick is honored as a martyr and a saint.